Right at the end of June and the beginning of July, I had the pleasure of spending a few days with a friend in the city of Innsbruck, Austria, where I had never been before. He wanted to share with me the cultural and religious treasures of his town. I was deeply impressed. As with every other place in Austria, Innsbruck is permeated with the monuments and the spirit of Catholicism. In a number of installments I will share with NLM readers the best and most interesting things I got to see there. Today's article will focus on the cathedral church of Innsbruck, the Domkirche St. Jakob, which was rebuilt in the years 1717-1724 in the Baroque manner according to plans by Jakob Herkomer aus Fuessen and since 1964 has been the cathedral of the Diocese of Innsbruck. In the sanctuary, directly above the high altar, stands the famous Mariahilf icon, a beloved painting by Lukas Cranach the Elder (1472-1563), which is considered the city's patroness (as we would say in English, Our Lady, Help of Christians). Art historians disagree about when this painting was executed. For a long time, it was said to be from 1514, but there is evidence that it dates from much later, when the artist was already close friends with Martin Luther and an artistic propagandist for Lutheranism. Whether the painting dates before or after 1517, one thing is clear: it is a marvelous proof of the truth of St. Thomas Aquinas's claim that we must judge the work of art differently from how we judge the artist as a man. 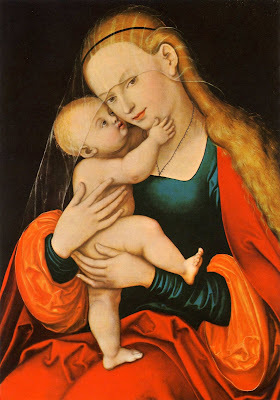 Cranach was a master painter who produced many exquisite images of the Madonna and Child, and this one, full of tenderness, piety, and beauty, has been venerated by Catholics for centuries. Although Luther was not nearly as anti-Marian as later Protestants became (especially in the American evangelical and fundamentalist world), there is still something exquisitely ironic about a famous Marian icon, object of countless pilgrimages and prayers, coming from the brush a fervent Lutheran. The other is Blessed Carl Lampert (1894-1944) was an outspoken critic of the Nazi regime and was finally taken captive in 1943 and guillotined in 1944. He was beatified by Cardinal Amato in 2011 on behalf of Pope Benedict XVI. Two other side-altars: that of the Sacred Heart, and that of Our Lady of Sorrows. Above the latter stands a larger-than-life and rather theatrical sculpture of St. Peter Canisius, who is indicated as "Patron of the Diocese." The organ is impressive. As part of the cathedral's organ recitasl series, an organist from Munich performed on the evening of the morning on which I took these pictures. My friend and I headed back to the cathedral for the concert of Muffat, Frohberger, Mendelssohn, Schumann, and (of course) Bach. Fairly small print, but then again, these are supposed to be mnemonic devices... Last but not least, one of my favorite features in any traditional church: the giant pulpit suspended from the wall, out of which the Word of God would thunder forth in ages when the clergy felt confident in their message and the faithful felt in need of it. The fact that these pulpits today loom like benign Baroque tumors while the clergy preach from toothpick lecterns is only one of countless signs of the utter loss of public liturgical-hierarchical conviction. It's like having the worst of both worlds: minimalist liturgy with maximalist bureaucracy. But now I am starting to digress. Part 2 will be a visit to the Jesuit church -- including the tombs of a couple of the most notorious residents of Innsbruck.